Nicholas Van Young in ‘Sound Language’. It is out of this that three distant tribes gather in the hopes that an outcast named Dig (played by Van Young) can heal the world through “the power of unity”. “The film takes a creative spin on the classic ‘Rain Dance’ and flips it into a unique ‘Sun Dance’. Above all, Sound Language speaks, or shall we say ‘dances’, to the power of unity,” Hines explains. 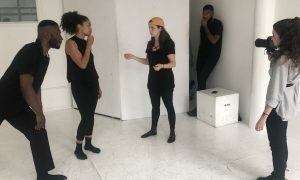 Besides Van Young and Arnold, the cast features Só Dança athlete Aaron Tolson, Christopher Broughton of Dorrance Dance, dancer and studio co-owner Ebony Rose, hip hop dancer Erik Moore, and dozens of student performers. ‘Sound Language’ featuring Nicholas Van Young and Maud Arnold. While Poiley’s personal journey toward a dance career shifted due to a dangerous heart condition, he eventually received a life-saving heart transplant that allowed him the ability to dance and choreograph again. 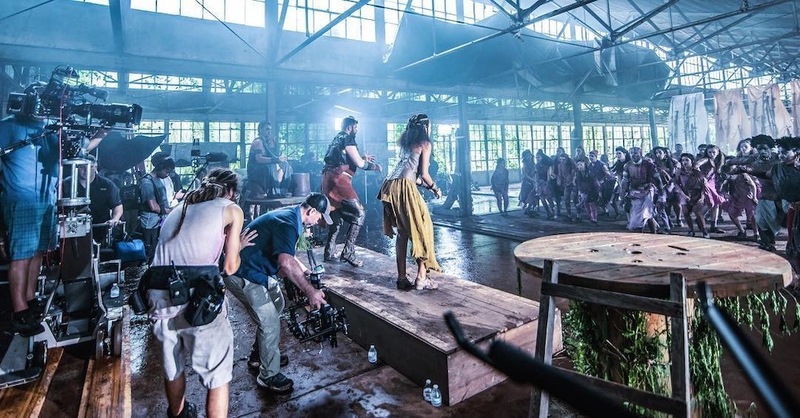 Shot at an abandoned orange factory plant in De Leon Springs, FL, filming was met with some challenges early on. Besides weather issues that directly affected the plot, there were also issues with attaining full cinematic coverage. 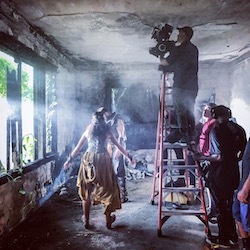 The film’s choreography is accredited mostly to Poiley himself, but there are many instances when the dancers contributed segments and a few moments when they improvised. The film’s three tribes — the Tap Tribe, the Step Tribe and the Drum Tribe — all speak in their individual languages. To better assist viewers in following their “conversations”, the film has subtitles. On set, Poiley took two things very seriously: safety and quality sound recording. 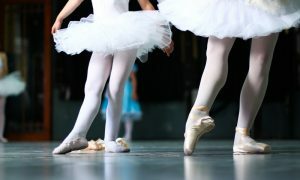 The facility had barren concrete floors and as a tap dancer, Poiley knew that would be unsafe for performers to dance on for 12 hours straight. So his team spent time creating a wood floor that would protect dancers and that could blend in with the dystopian environment. They also went to great levels to make the audio top-notch, even re-recording dances for crisper sound. Scott Poiley, Kevin Burroughs, Nicholas Van Young and Maud Arnold on set for ‘Sound Language’. Now that the film is in post-production, it has been submitted to various film festivals. Even though it’s still early on, the team has already received news that it is an Official Selection for various events and has won awards at one festival. Keep your eyes peeled on Só Dança’s Facebook and Instagram pages for announcements and updates on this film. Poiley anticipates it will be released to the public sometime this summer or in the fall.